Love it bro. I like how you can look down and see your arms. I wish there was a mod to see your feet. I always hated how FPS games never add feet. Like how Halo does it, or Dead Island even. 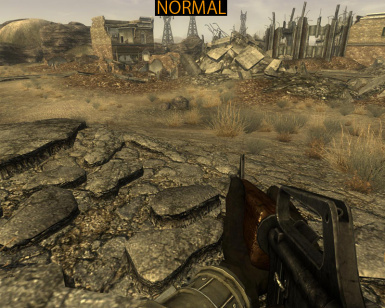 There's the enchanted camera mod for NV. Go look it up if you haven't. Great mod! 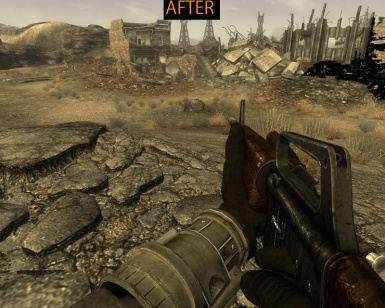 For those wanting to see their feet along with this mod download Enhanced Camera by LogicDragon: http://www.nexusmods.com/newvegas/mods/55334/? This is a great mod. If you have a weapon animation replacer don't worry, they're compatible. Now can you do the opposite, where the gun actually follows the crosshair? If not, that is fine. So, any plans to make the gun more down to the waist? I played Arma2. Although I like it that you can see your body, I don't like the independent head movement. I'd rather we had a head movement with limited speed (more natural) and I'd rather 1st person view connected to 3rd person view.